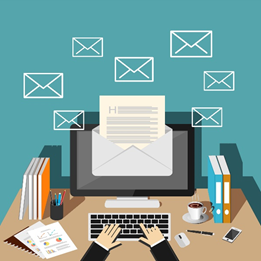 Why does email marketing work so well? Among the biggest mistakes a business owner could make is to assume that email marketing has lost it’s cool in the current digital climate. A solid email marketing strategy can place you in a fantastic position to engage your target market. A great email offer goes far beyond standard spiel schmoozing- it’s your chance to approach your consumers from a place of integrity. This is particularly useful when communicating with younger generations who tend to respond more favourably to proof-based, authentic product and service stories than they do sentimental marketing appeals). When your market is more than likely to regularly check their email, what they’re looking for is mail that matters. In the case of email marketing, you can create and sustain lasting relationships with your consumer base, provided you follow a few rules. So, what do you need to know to make sure an email marketing campaign is the gift that keeps giving? 1. Use the recipients first name, always. Using your recipient’s first name is not only essential for reaching them on a personal level, (personal engagement is the aim here, in case you’ve missed it) it’s less likely to alienate anyone with an inappropriate pronoun or A first name basis should always be shared, by the way, so sign off using yours, too. Especially not Mr, Mrs, Miss, Mx. One of the fastest ways to make your email irrelevant is to feign knowledge about your recipient. Stick to what you know and share it accordingly, and where appropriate in a campaign. Don’t hang around in the greetings zone too long. Make sure the first couple of lines indicates your offer clearly. This can take serious copy crafting and serious editing- but no one said it’d be easy, right? 4. Know thy open-ended questions. Asking an open-ended question is more than just creating space for a conversation to take place. An opportunity to tap into your market’s passion, the difference between “Do you like music?” and “Tell me about your favourite piece of music” is that the conversation can expand into so much more than an obvious, dead-end answer. 5. Don’t make anyone work for your time. Are you prone to jargon? Are you a stat factory? Stop it now. Using jargon is never acceptable when you’re trying to personalise communication in an email marketing campaign. The second a reader suspects you’re trying to school them into liking you, someone starts looking for the unsubscribe drop down. Ask yourself if what you are trying to say is really, truly relevant to the recipient. Are you filling your email with meaningless garb? If not, great. If so, start again- because you’re certainly not making any economical sense. One Stop Media is a leading email marketing service agency in Melbourne, Australia. We’re committed to helping our clients grow their businesses with campaigns that are effective, personalised and far-reaching. If you’d like to know more about the services we offer, contact our team of passionate marketing buffs today on 1300 305 619.